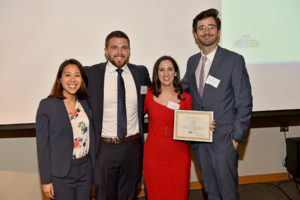 The Final Round of the Lowell Milken Institute-Sandler Prize for New Entrepreneurs is a public competition in which the final six teams each had 20 minutes to present their venture and answer questions from the judges. 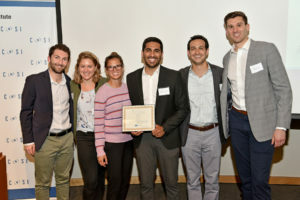 For the 2018-19 competition, there was a First Place Prize of $70,000 awarded to Team BruxA, a Second Place Prize of $30,000 awarded to Team EvalueMe, and an Audience Favorite Award of $1,000 awarded to Team Neighborhood Works. BruxA aims to improve the treatment of sleep bruxism by providing a smart night guard and mobile application to track nighttime teeth grinding. By tracking this activity over time, our product helps both patients and dentists to take the appropriate action in the management of sleep bruxism. EvalueMe is enterprise SaaS that uses Artificial Intelligence to coach employees on writing meaningful, actionable, and unbiased performance reviews. EvalueMe aims to bring equality to career advancement and build inclusive workplace cultures to promotes trust, innovation, employee retention and engagement, and business value. Neighborhood Works is an affordable real estate development company that builds permanent supportive housing to combat LA’s homeless crisis. By utilizing innovative financing strategies and new zoning policies, they strive to build affordable housing in a more cost-effective manner. Missed the event? View the event program. Learn more about last years winners. This event was open to the UCLA community and invited guests. 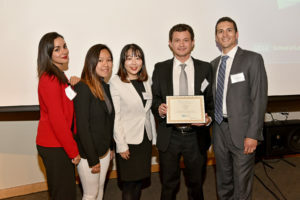 It was sponsored by Lowell Milken Institute for Business Law and Policy and UCLA School of Law.